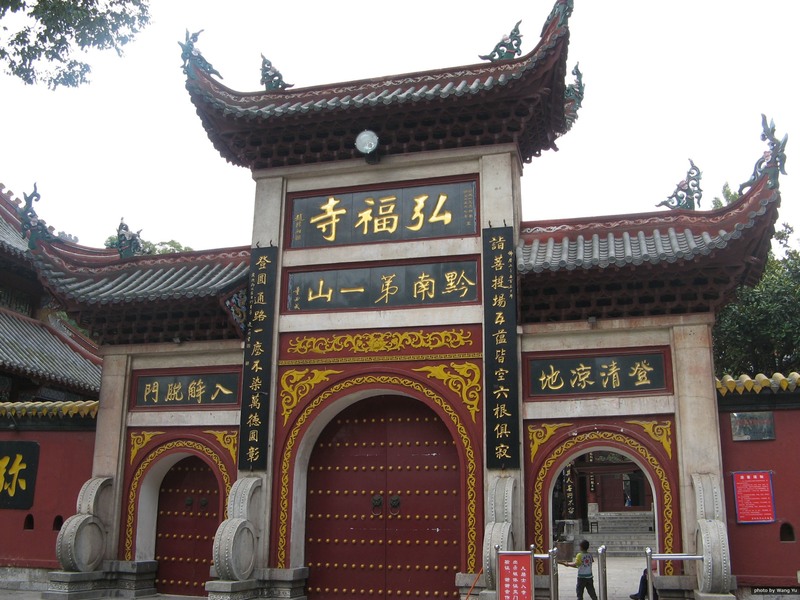 Hongfu Temple is a Zen Buddhist temple situated in the mountains of Guiyang City. With a history of over 300 years and a large collection of Buddhist books, it is the best temple in Guizhou. Location: It’s situated on Qianling Mountain, which is in Qianling Park, Guiyang. It is about 1.5 kilometers (1 mile) from the downtown area and is hidden in a forest. Walking around the temple, you may be pleasantly surprised to find some ancient poems inscribed on the stonework. They were written by ancient Chinese literati. An experienced local guide will help you to understand these ancient Chinese literary works. As well as many ancient temples, there are clusters of ancient towers and a dense forest in an area called the Tower Forest. These ancient towers are the tombs of the monks who used to live in the monastery. For more detailed information about the monks’ tombs, a knowledgeable local guide will explain them to you. There is a large collection of valuable Buddhist books there as it used to be a Buddhist school. On the windowsill in the reading room, there are various audio-visual products and scriptures that have been translated into many languages. You can sit down and read them in the reading room. In the temple’s Bell Tower, there is a bronze bell weighing more than 1,500 kilograms (3,300 lb). It is an ancient object that was cast in 1469, during China’s Ming Dynasty. The temple is famousfor people making wishes there. Thousands of people go to the temple to receive a blessing. If you have a wish then, just like the locals, tell it to the Buddha and ask him to help make your wish come true. There are three main buildings in Hongfu Temple:Heavenly King Hall, the middle hall (the Bodhisattva Hall), and the main hall (the Mahavira Hall). Maitreya and the Four Dharma Kings are enshrined in this hall. At the south side of the hall is the inscription of ‘The Sutra of Terra-Treasure’. There are huge mural paintings on both sides of the main hall. The 32-armed Avalokitesvara (Guanyin) is enshrined in this hall; it represents the 32 forms of Avalokitesvara. Behind it is a statue of Skanda Buddha, which stands for banishing evil. Sakyamuni Buddha, Manjushri Buddha, Samantabhadra Buddha, and the 18 Arhats are enshrined in this hall. The statues are covered with gold foil. There&apos;s also a jade Buddha statue from Rangoon, the capital of Burma (now known as Yangon in Myanmar). It is 1.5 meters high and weighs 900 kilograms. The statue looks benevolent but solemn, and it stands among more than 10 other jade statues of Bodhisattva and Maitreya. Hongfu Temple is located on the mountain and there are two ways to get there. If you like mountain climbing, choose to hike to the temple so that you can enjoy the beautiful scenery along the road. Alternatively, take a cable car to the top of the mountain and then take a 5-minute walk to the temple, which is very relaxing. There are many adorable monkeys living in the forest around the temple. They are not afraid of humans and they often play on the roof of the temple or on the steps.Most of the time, they are very gentle and friendly, and there will be special monkey “nannies” to take care of them. Still, don&apos;t provoke them to help prevent them from being mischievous. As there are so many ancient inscriptions, murals, and ancient Chinese buildings there, it is recommended to hire a local guide to explain the temple&apos;s history to you. Qianling Park is a comprehensive park integrating natural scenery, cultural relics, folk customs, and entertainment. It is composed of seven scenic highlights, including Hongfu Temple, Qianling Lake, the ‘holy fountain’, Macaque Garden, a zoo, the &apos;tiger&apos; inscription, and Kylin Cave. Each scenic spot has its own unique charm. Read more about Qianling Park. We provide one of the best tailor-made tour services in China and can include Hongfu Temple and any other attractions you want to see in your Guizhou tour. With our expert and experienced tour guides and comfortable private transport, all you need to do is enjoy the tour! Click here to request your tailor-made tour plan.